Visitor guide to Bullfrog Marina watercraft rentals and houseboat rental is located in Lake Powell, and the second largest marina on the lake in Bullfrog, Utah. Bullfrog Marina boat renals is located 70 miles from Hanksville, Utah and 95 lake miles from Glen Canyon Dam in a watercraft, and is mostly used by Utah and Colorado residents. Bullfrog is also located across from Halls Crossing Marina, and is a five hour drive from Salt Lake City, Utah; and Denver Colorado. 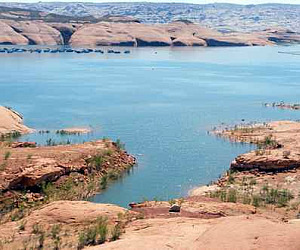 Lake Powell’s main use is for water storage for major metropolitan areas such as California, Utah, and Arizona. However Lake Powell has become to be know for the best water sport recreation paradise houseboat vacation in the world offering waverunner rentals, PWC sea doo rentals, jet skis, flyboard water jet pack trips, and guided boat charters and lake tours. Bullfrog Marina wakeboard boat rentals offers the 2nd widest variety of services on the lake outside of Wahweap. The National Park Service provides a public launch ramp, portable toilet dump station, free boat pump-out station, picnic area, fish cleaning station, RV hookups, camping spots, and a small airport called Bullfrog Basin Airport. Enjoy Luxury Houseboat rentals and full complement of visitor services, including: a lodge called the Defiance House Lodge, restaurant called the Anasazi Restaurant, gift shop, grocery store, 2 campgrounds, laundry, showers, service station, ski boat rental, boat tours, and boat repair all at Bullfrog Marina. Invert Sports provides water sport lessons at Bullfrog Marina which can include; wakeboard lessons, wakesurf lessons, water ski lesson, kneeboard lessons, and wakeskate instruction. Some of the favorite scenery and places to see on the Utah side of Lake Powell are; Escalante Canyon (river), San Juan Arm Canyon (river), and Hole In The Rock.